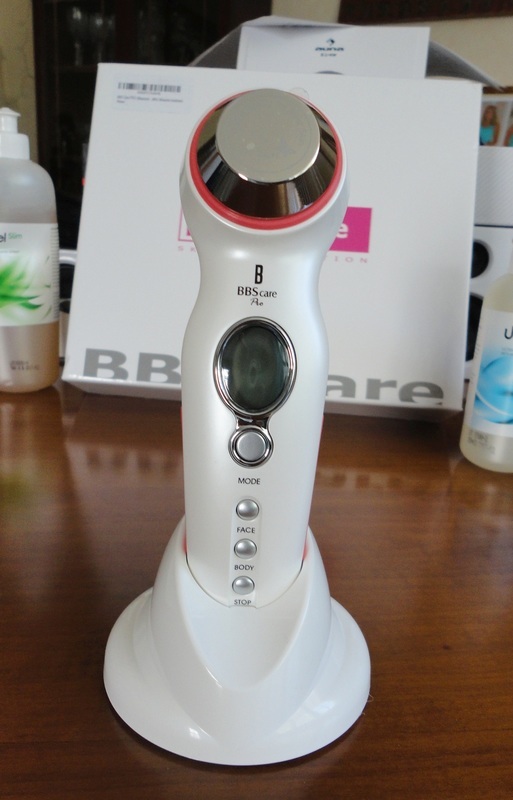 This beautifully-designed ultrasound massager does so many things, it is difficult to cover them all. When I was offered the opportunity to test-drive a sample unit, I jumped at the chance. At 62, my face has started to show more expression lines than I like, and there is a certain drooping and loss of tone which I hate to see in the mirror. Also, following a period of inactivity with my leg in a cast, the dreaded cellulite has taken hold again, and I'm having trouble shifting it. So we are addressing anti-ageing and cellulite, but we are also testing it on enlarged finger joints, and on my husband's upper lip where a benign tumour was removed many years ago leaving behind bunched up tissue. There is a longish list of counter-indications, but basically it boils down to a few no-nos: pace-makers, the abdomen of pregnant women, healing fractures, malignant tumours, blood clotting disorders and major circulatory impairment. Apply your choice of serum, preferably containing hyaluronic acid, vitamins and some active anti-ageing ingredients. Your choice of slimming, anti-cellulite gel (the best ones contain caffeine), or just get the one made by the same company, which is designed to be used with ultrasonic therapy. It's called UB Gel Slim and you can buy it from Amazon. As I understand it, the main thing is that ultrasound waves operate through liquids, so treating dry skin is a waste of time. For optimum results, moisturise your face well and moisten your legs and arms (or other body area to slim down) with water and then apply the gel. During treatment, you need to place a small quantity of gel over the device head to keep it gliding. Included in the purchase is a bottle of UB Gel with Hyaluronic Acid, so use that as you go. The massager has a lovely shape and is easy to hold. There are four buttons, labelled: MODE, FACE, BODY, and STOP. Given its size, the LED display could hardly be larger and is, therefore, a bit hard to read, but once you familiarize yourself with the position of the various settings, it will be more than adequate to help you select your options. Operation is very simple but do read the manual first. Connect the power lead to the base of the massager and find a convenient wall plug. The cord is about 7 feet, or just over 2 metres. Press the FACE button to turn it on. You now have two possibilities: FACE and BODY. Using a short press of the MODE button, cycle through the various skin types until your selected one shows, highlighted in dark. In sequence, the choices are: Oily, Normal, Dry and Sensitive. It is a good design feature that these selections are lost with every use because on the same face you can find different types of skin. For example, my skin is mixed. So I would select Oily to treat the forehead and cheeks, but dry for the area over my mouth and under my chin, and Sensitive for the delicate skin under the eyes. Next you need to choose the treatment mode. Long-press the MODE button and don't worry when your skin type appears to be momentarily changed. The skin type display jumps back to what you had selected, and now you are ready to choose between: 1) Massage; 2) Lightening; 3) Wrinkle treatment; and 4) Lifting. These are self-explanatory. For most people, (3) and (4) would be most used for anti-ageing purposes, but you might want to try (2) over age spots and discolouration or (1) for a general circulation-enhancing effect. If you choose to start from (3), the massager will automatically jump to (4) after the preset treatment time (with a short beep). Press the BODY button. The only choice here is Massage, so you are ready to go. Move the device head over the area to treat with slow, deliberate movements. You are not going to feel anything, no tingling, no noise, no vibration, only a little heat in the Lifting mode and the Body Massage mode. It will feel like nothing is happening because ultrasound waves are not detected by human ears. The pre-set programs will end automatically with an audible sound. Most face programs are 2-3 minutes, and 15 minutes for the body, and these times should not be exceeded for the same body area. Daily treatments are fine, or else every second day will also work. For maintenance, once or twice a week. We are preparing a short demonstration video, but in the meantime I have posted some photos to show what you get in the box. As for results, we are monitoring improvements as we go, and I will update this review as appropriate. Some minor improvement will be visible in a relatively short time frame (days or weeks), but major changes take time, so don't expect an overnight miracle. The massager arrives beautifully packaged in a jewel-type box, lined with a white silky fabric and complete with a storage stand, the electric lead to plug it into a wall outlet, a bottle of treatment gel and the instruction manual in English and German (in my case). I believe a French manual is being prepared and will be ready soon. Build quality is impeccable and the presentation is impressive, so it would make a lovely present as well. So far I am really delighted with the ease of operation and huge range of potential uses, and really look forward to reporting on long-term results.